The Oshoosi is a deity believed to be the father of philanthropy and religious congregation for purity and sanity in Yoruba land. The festival is always held to honour Oshoosi and pray to him. The lingering crisis within the All Progressives Congress (APC) in Rivers state has become a major blessing to the state ruling Peoples Democratic Party (PDP) which remained unchallenged in the forthcoming general elections. It is all smiling for PDP as all candidates of APC have been barred from contesting elections in Rives state by the Independent National Electoral Commission (INEC) following orders of the courts. INEC’s Resident Electoral Commissioner (REC) in the state, Mr Obo Effanga, said the decision by the commission followed the outcome of the ruling on the litigation between two factions in the state’s APC. Simi is literally telling us that she's PREGNANT, something I told you first on Twitter when she tongue kissed Adekunle Silver on that concert stage. See the cryptic message in the outfit #CardiB and #beyonce already rocked. I hear they even married sef. I feel sorry for that baby. The combined voice of Simi and Adekunle will keep a baby up all night. Don't ask me any JAMB questions, #ASUU strike is on #SimiGold's official wedding picture. I gbadun the gold outfit and the baby in the second trimester. Beautiful Daughter of Popular businessman Femi Otedola, Tolani shares the official romantic music video for her just-released love song BAMILO featuring Reekado Banks. A young lady with a strict Islamic upbringing that entailed wearing the hijab and looking covered-up appears to have embraced extreme western values. The Muslim Twitter user, @mztuara named Jane shocked fellow users on the platform after she shared her transformation photos as part of the #10yearschallenge . President Buhari on Tuesday launched a new enhanced security Nigerian passport with 10 years validity. Buhari performed the ceremony at a meeting of the Federal Executive Council (FEC) at the Presidential Villa, Abuja. The FEC meeting was held a day earlier, to enable the President to participate in the All Progressives Congress (APC) rallies in Edo and Delta states on Wednesday. Buhari was immediately issued his own 10–year validity passport, by the Comptroller General of the Nigeria Immigration Service (NIS), Mohammad Babandede. HRM Oba Elegushi Ademola of Lagos also participate in trending 10years challenge as he shares adorable throwback photo before he becomes a king in Lagos. Prominent Nigerians including President Muhammadu Buhari and the leader of the ruling All Progressives Congress (APC) have been celebrating one the respected pillars of the party, Chief Bisi Akande as he clocks the enviable age of 80. President Muhammadu Buhari, in a statement from the office of his spokesman, Femi Adesina joined all members of APC in saluting the first Interim Chairman of the party and former Governor of Osun State. The President congratulated Chief Akande, his family and friends for the laudable achievements over the years, which threw him into the limelight at an early age, particularly highlighting his sacrifices in public service at both state and national levels. Despite all the evil, false accusations, derogation of office, attempt to frame him for robbery and many attacks on his person and office, the man remained civil and focused on the Nigerian project. As a man who stands for peace, he actually shook the hands of the outgoing IGP during the event. Very few people will shake hands of the man who has done them much evil considering the fact that at the time of the event Sen Dino Melaye an ally of Saraki was still under detention by the same man. The road leading to Adebayo Adelabu Penkelemesi life successes are neither without bumps or sketchy path, they are pathway maligned with a jagged edge and sharp turns yet he has risen beyond these life challenges and make merry of the turbulence therein. Whatever life throws at you even if it hurts you, just be strong and fight through it. Remember, strong walls shake but never collapse. If you ever inquire about his early life from him or his friends, it is never kept in shade from the public glare simply because it connotes a song of victory, many people are in awe of his growing up days leading to his success story. He started up with his grandmother whom he lived with and while keeping up with the chores necessary from his paternal grandmother, he subsequently excelled in his academics. Like many kids back then who grew up from a rather poor background, he had to hawk food items around and sell to eat. If you care to listen, he would tell you he trades for his granny round the outer cities of Ibadan which were mainly market squares back then. He would jokingly add that 'you'd be proud to complete two meal a day in those days' as you would have to sell before you can eat from the profit accrued. A Nigerian mother's post caused a bit of panic on Instagram on Sunday as a great number of people, including celebrities, tried to reach out to her for fear that she might do something rash and irrevocable. Tinubu Pictured With Godswill Akpabio At Abuja Airport. Co-Chairman of the All Progressives Congress (APC) Presidential Campaign Council, Asiwaju Bola Ahmed Tinubu and the South-South Coordinator, Senator Godswill Akpabio at the Nnamdi Azikiwe International Airport, Abuja enroute Bauchi for APC rally on Saturday, January 12, 2019. The leader of the Indigenous People of Biafra, (IPOB) Mazi Nnamdi Kanu yesterday declared that the decision of his group to boycott the 2019 elections will have Abia and Ebonyi states’ governorship elections as exceptions. Kanu said that the reason behind the decision to participate in Abia and Ebonyi governorship elections is to remove Governor Okezie Ikpeazu of Abia and his Ebonyi counterpart, Dave Umahi whom he described as “enemies” of Igboland. It is learnt however that he may be flown abroad for further treatment. News broke out a few weeks ago of top Nollywood actress, Funke Akindele welcoming twins with her husband, JJC Skillz and a lot of people couldn’t keep calm with congratulatory messages. The actress later came out with photos on her Instagram handle which thus confirmed the news information. However, a new video has emerged which purportedly shows her rocking her baby bump while filming her Jenifa Diaries months ago and also rocking one of the twin babies singing gospel music. Six governors of Nigeria’s South-South region have called an emergency meeting to discuss the planned arraignment of Chief Justice Walter Onnoghen. The meeting is scheduled for Sunday in Abuja, Mr Dickson’s spokesperson Fidelis Soriwei added in an e-mail announcing the planned caucus. Men have been warned to be careful of the ladies they take home from nightclubs or bars following an incident which has gone viral on social media. According to reports, a lady in a bid to rob a man who took her to his home allegedly drugged him after a drinking spree. It was gathered that the yet-to-be-identified lady was already stealing his household items after the man passed out but was caught by the neighbours who saw her in action. The lady was apprehended by the neighbours but rescued by the police who prevented her from being lynched, according to reports. The die is cast. In 34 days, the 2019 presidential contest would have been won and lost by candidates seeking the mandate from 84 million Nigerian voters. 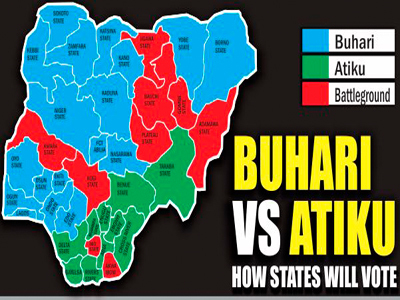 In this piece, Yusuf Alli, Managing Editor, Northern Operation; Sam Egburonu, Associate Editor and Dare Odufowokan, Assistant Editor, report on the chances of the parties – especially the largest one – the ruling All Progressives Congress (APC) and main opposition People’s Democratic Party (PDP) – who given their spread have best chance of claiming the prize. 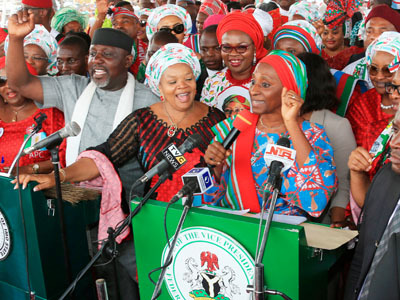 Tension heightened in Imo State yesterday, after the wife of the president, Aisha Buhari disagreed with Governor Rochas Okorocha, after the governor boasted that his son-in-law, Uche Nwosu will win the governorship election rather than the candidate of the All Progressives Congress (APC), in Imo state, Senator Hope Uzodinma. The Master of Ceremony hired by the state government refused to recognise the presence of Senator Uzodinma and Senator Ben Uwajumogu.